Fundamental questions in the effort to understand brain function and cognition concern the physical connections between neurons and the rules that govern the architecture of what has been called the “cortical local circuit”; the collection of a hundred or so interconnected neurons that many believe to be the basic unit of neuronal computation, a unit that is reiterated many millions of times throughout the volume of the cortex. What does the local circuit look like? 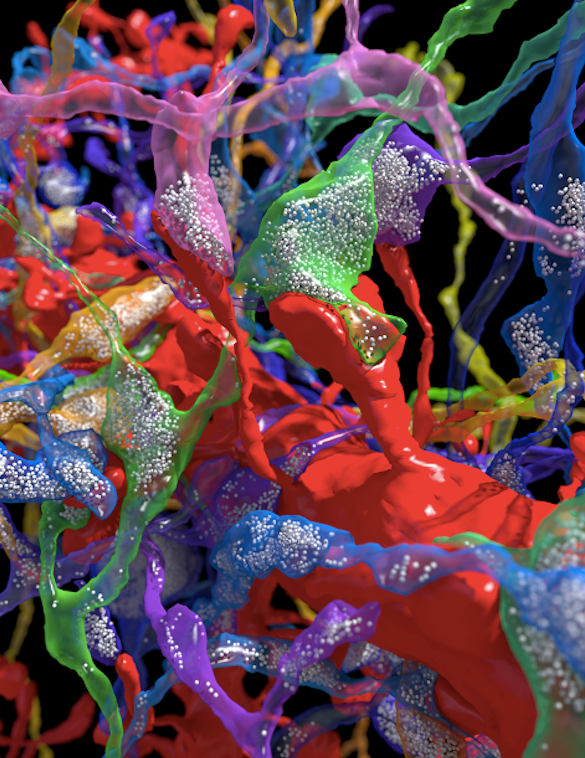 To address that question, researchers from a number of institutions, and representing several disciplines, got together to image a piece of the mouse visual cortex at the ultimate spatial resolution. The work occupied Narayana Kasthuri, Jeff Lichtmann and a great many of their colleagues for a period of about six years. Their study is exceptionally detailed and focuses on the structure of neurons, their dendritic and axonal projections, synapses as well as subcellular structures including synaptic vesicles, dendritic spines and post-synaptic proteins. 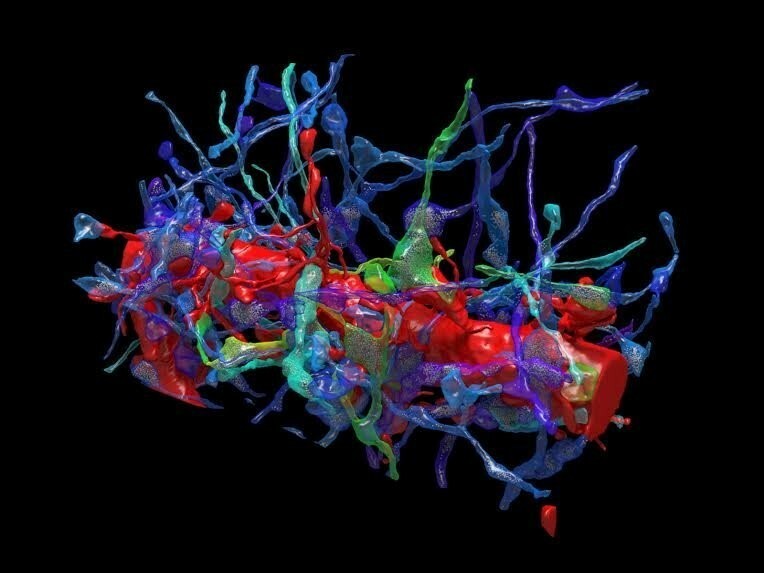 An enormous collection of images was gathered and stitched together to create a concatenated and indexed tomographic view of a piece of mouse cerebral cortex that includes 1,700 synapses. The result is simply beautiful. It is important work because it helps inform us about the anatomical basis of cognitive processing. You will find the original article, published in Cell, here. In this piece, I have reproduced some of the images. Please remember, these are tomographic reconstructions from data, not cartoons. Jeff Lichtman describes the goal of the work in this excellent video , and the team describes their methods here. Carolyn Gregoire wrote an excellent article for the Huffington Post with more images. See it here. I think you will enjoy the beauty. 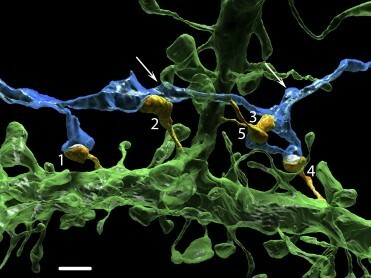 In this image one axon (blue) makes five synapses (orange, labled 1-5) onto the basal dendrite (green) of another neuron. Arrows point to other varicosities of the axon that innervate dendritic spines of other neurons (data not shown). Scale bar, 2 microns. 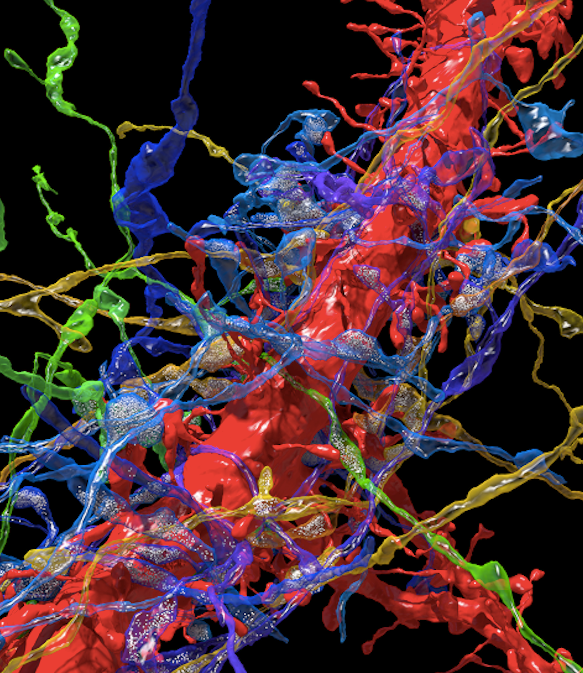 This image depicts a dendritic process of a single neuron (red) and the axons of three other neurons (blue, purple and green), some of which form synapses — the bridges between neurons that allow the axons to communicate– with the dendrite. 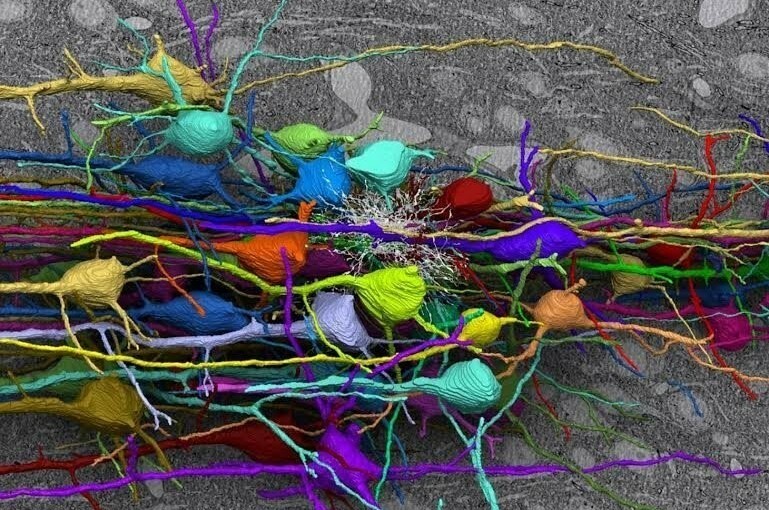 A close-up showing synapses running along the branch of a dendrite. The white dots inside the axons are synaptic vesicles that store neurotransmitter molecules and release them when the axon is activated; the most prevalent mechanism of information transfer between neurons. A high-resolution view of synapses and synaptic vesicles within presynaptic terminals. Remember, this is not a cartoon- it is a tomographic reconstruction!